Due to delays with council processing our DA, the market has been postponed until Spring. Thank you for your patience and join our mailing list or Facebook page for further updates! Incubate your new creations, arts, craft, fashion and creativity; test your new product ideas and be inspired by others; forage amidst the fruits of friends gardens; upcycle your vintage treasures and taste tantalizing street treats. * if you do not have public liability insurance, you can pay an additional $8 per market and our insurance company will provide you with insurance for that market day. This option is not available to people with stalls that include massage, live animal sales, second hand tools or electrical goods, children's toys and play equipment. 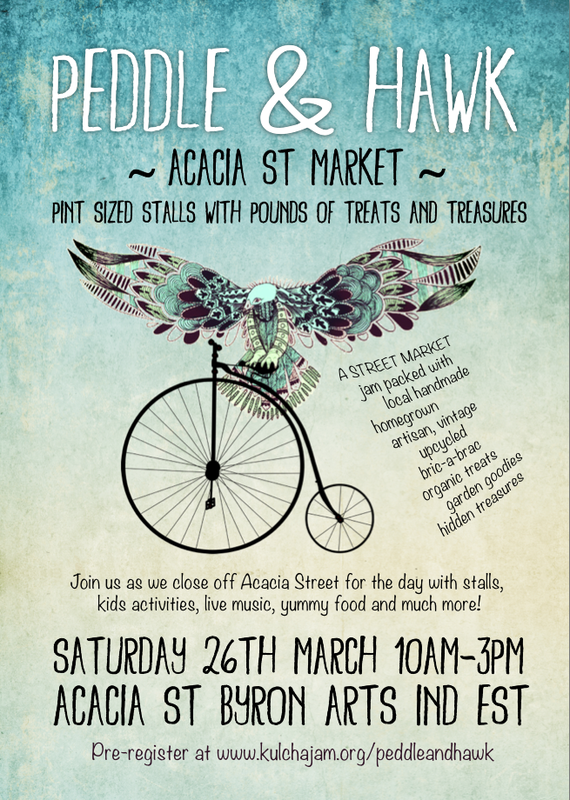 Stalls at "Peddle and Hawk" are intended to incubate and foster a community of local creators, artists, artisans and designers, and encourage home grown and handmade produce, vintage and up cycled goods and recycling. If your proposed stall does not fit into one or more of the following categories, contact us to check if your proposed products fit into the market's vendor's policy.